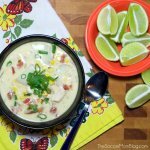 Thai Corn Chowder is one of those recipes you have to try. Packed full of yummy flavor you'll wonder why you didn't make it sooner! Add cubed chicken breast to a large Dutch oven or soup pot on medium-low heat with grated ginger, diced onion, and a tablespoon of cooking oil. Stir for 1-2 minutes until the outside of chicken begins to lightly brown. Add garlic. Add coconut milk, chicken broth, potatoes, and lemongrass stalks (crush them lightly with a mallet to release the flavor; you'll remove them when soup is finished). Add remaining ingredients, cover, and continue cooking for 30-40 minutes. Garnish with sliced green onion and/or basil and enjoy!